Back to Normal When Disaster Strikes. If you’re like most Americans, you probably don’t know where to begin when it comes to cleaning up after a fire, flood, or mold infestation. As Illinois’ go-to resource for home restoration, we’ve received countless questions about how to proceed after a disaster occurs in a home. We answered a few of our most commonly received questions in a previous post, and in today’s post, we’ll continue to answer your questions about home and furniture restoration. Midwest Restoration Services is proud to provide Batavia and the surrounding areas with Top Rated Local® restoration services following natural disasters and other forms of home damage. We offer emergency services 24/7, and our team will work quickly and effectively to restore your home and belongings. We offer free estimates – call today to take the first steps toward restoring your home! Can My Furniture Be Restored After Being Affected by Water Damage? While each situation is different, in general, most furniture can be restored after being damaged by water. Leather furniture can usually be treated with specialty products designed to remove watermarks and other signs of damage. Upholstered furniture will need to be assessed according to the extent of the damage. Generally, upholstered furniture can be cleaned and treated with special chemicals, but it may need to be reupholstered entirely if the damage is severe. This fact may come as a surprise, but wooden furniture, including tables, chairs, and benches, can often be completely restored following water damage. Unless the furniture has begun to rot from the inside, it’s highly likely that sanding and refinishing your wooden furniture will completely restore it. 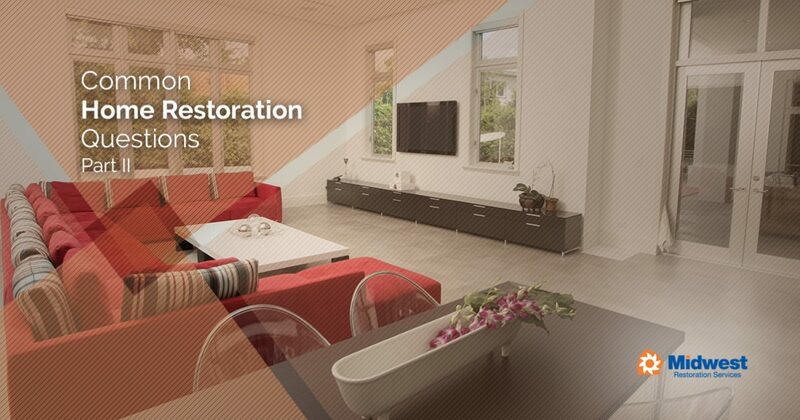 If you’re wondering whether your furniture can be restored after being damaged by water, just give the restoration experts from Midwest Restoration Services a call! 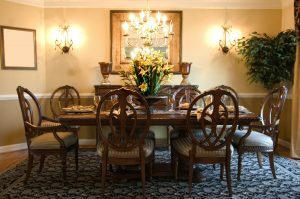 We’ll provide you with a no-cost, no-obligation estimate that outlines the next steps you should be taking in order to restore your furniture. Will I Have to Replace My Carpet If My Home Has Been Affected by Mold? If your home has been damaged by water, or if you live in a damp climate, then you should always be on the lookout for signs of mold and mildew in your home. One of the first places you should inspect is your carpet, as it’s easy for mold to grow between the fibers and underneath the padding without showing any noticeable signs. While every case is slightly different, you can generally use time as an indication of whether your carpet will need to be replaced. If you notice mold growing within the first 48 hours of water exposure, it’s overwhelmingly likely that you will be able to use specialty cleaning products and a powerful vacuum to remove the spores and bacteria from your carpet. If mold has been growing for more than 48 hours, then you will probably have to replace at least some of your carpet. While specialty shampoos and vacuums will be quite effective at removing mold from the surface of your carpet, mold will begin to spread to the padding and areas beneath your carpet after a period of 48 hours. At this stage, it’s generally cheaper to replace a section of your carpet than it is to hope that the mold won’t recur after several rounds of treatment. It’s important to note that guidelines from the Institute of Inspection, Cleaning, and Restoration (IICR) dictate that carpeting affected by water damage should be removed and thrown away. This includes disposing of the padding beneath the carpet, as this minimizes the possibility of mold recurring. While the IICR’s guidelines are not federally enforced, the IICR is one of the most reputable mold damage authorities in the United States. Midwest Restoration Services has helped hundreds of people in Batavia and the surrounding areas with mold restoration, and we’d love to help you restore your home. We hope that this post will provide you with the knowledge you need if you ever find that your home has been damaged by water, fire, or mold. Keep an eye out for future posts in which we’ll continue to provide you with answers to the most common questions we receive about home restoration. Contact Midwest Restoration Services today to schedule a free estimate!